Welcome to Washington Dulles Taxi. We offer a taxi transfer service in Metropolitan area of Washington DC. We cover Virginia Maryland and the beltway area to Dulles Washington International (IDA), Ronald Reagan National airport (DCA), Baltimore Washington International Airport (BWI) and Union Station. We are just a phone call away, and committed to serve you to these major airports 24/ 7. No need of advance booking! Washington Dulles Taxi provides top quality services to all the passengers. Your safety is our primary concern and our prior aim is to give you maximum comfort. Our fleet of vehicle is all well maintained and licensed by the public carriage office. Our drivers are highly trained-professionals with sophisticated manners and customer friendly behavior. The packages of Washington Dulles Taxi are very competitive and you will feel comfort and luxury in your ground transportation. Our motto is ALWAYS BE ON TIME! Our services are very reliable and dependable. Our professional chauffeurs are always there on airport to help you out from your safe and comfortable road transportation problem. Trust Washington Dulles Taxi and they will not let you down. 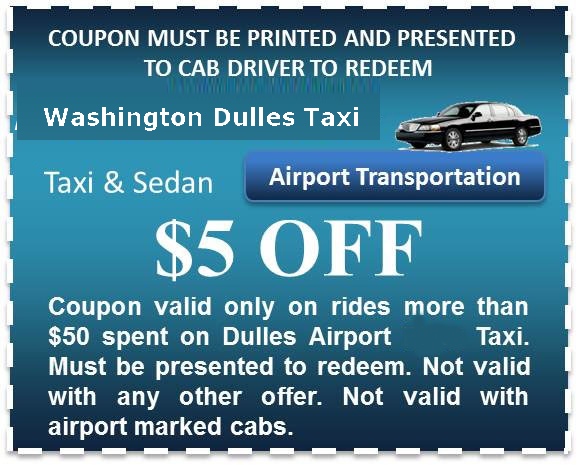 Drivers of Washington Dulles Taxi are highly trained, competent and able to attend to your needs. They are the true professionals who know exactly how to perform duty and win the praise of the clients. They are always there in all the three major airports in the DC Metropolitan area. Among all the other Dulles Airport transportation, Washington Dulles Taxi are more convenient to hire as while traveling with us, you do not have to face the parking problems. Our drivers greet you with happy faces, assist you with your luggage and make your transportation comfortable.